New U.S. sanctions against Russia could jeopardize Nord Stream 2 and TurkStream projects’s finish, Russian energy giant Gazprom warned Tuesday. In its third quarter report, Gazprom said the sanctions will have a negative impact on the company’s foreign investments and put the gas line projects at risk. “In order to analyze the relevant risks correctly, the U.S. Department of Treasury needs to clarify the scope of the sanctions,” the report read. In August, U.S. President Donald Trump reluctantly signed into law further sanctions, cutting the length of maturity of bonds issued by major Russian banks and energy firms that U.S. individuals and institutions are allowed to trade. 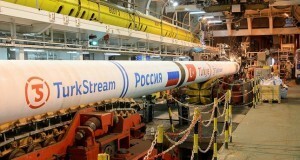 This would allow Gazprom’s two big pipeline projects to go ahead, although at a higher price and with some delays. The Kremlin, dependent on oil and gas revenues, sees the pipelines to Germany and Turkey -Nord Stream 2 and TurkStream- as crucial to increasing its market share in Europe. It also fears that Western partners -needed to develop the deep water, shale and Arctic gas deposits that will fill the pipelines- will be scared off by sanctions. With all that in mind, the Russian gas giant is taking steps to reduce the impact of sanctions.